That music is the second thing you’ll notice, and it accentuates Jovan’s condensed reality perfectly. Guitars, keyboard, bass and drums whirl around you, keeping you cocooned in jazz-inspired majesty. Singer-songwriters sometimes slack in this part of their work, but here you’ll hear the true strength of musical collaboration and insight, as these “singer-songwriter” tracks are elevated to sophisticated triumphs of sound. Check out, especially, Stephen J. Gladney’s tenor sax on “16 Shots,” which grabs you and traps you exactly where you want to be. Mykia Jovan's debut record is titled Elliyahu and features eight original compositions, all of which she has performed live for several years prior to heading into the studio. Released September 1, 2017, in just two months the lead single, "16 Shots," received over 65,000 streams on Spotify and was included on the platform’s official State of Jazz Playlist alongside artists like Christian Scott and the Preservation Hall Jazz Band, Kamasi Washington, and many others. On December 12, 2017, Mykia was nominated for Offbeat Magazine’s Best of the Beat 2017 Awards in the category Best Emerging Artist! To vote please visit http://www.offbeat.com/news/nominees-best-beat-2017/. And this performance of "16 Shots:"
Mykia Jovan is a vocalist and songwriter from New Orleans, Louisiana. 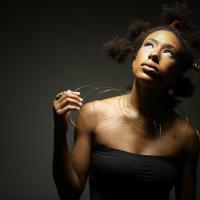 Her unique voice has drawn natural comparisons to the great Billie Holiday and Erykah Badu, while her original compositions and live performances have established her as a singular voice in the modern progressive soul scene. Check out her web site at www.MykiaJovan.com.